Offaly’s grim subservience to their neighbours is getting almost ghoulish at this stage. It’s now 10 (or as Sky might put it: TEN) wins on the trot for the Lilywhites against their old foes at senior level. That run stretches back to the summer of 2006 and in truth Offaly have never looked further away from breaking that hoodoo than on a dark, somewhat depressing afternoon at O’Connor Park. This game was over in the 12th minute. Not on the scoreboard perhaps, but the cheap red card picked up by Offaly corner forward Nigel Dunne signalled the end of the midlanders’ lively early display. Dunne tackled Cathal McNally near the sideline and let indiscipline get the better of him by following up with a blow to the face. Pat Flanagan argued it was a nonsense decision but he was wearing tri-coloured glasses. The early exchanges saw Offaly look relatively menacing, whenever they could keep their feet. Both teams seemed to have forgotten to put on winter tyres and the damp conditions saw too many players unable to retain equilibrium. Peter Cunningham and Dunne were quick off the blocks though and had two points on the board for the home team inside 3 minutes, sandwiching a fine effort from the workaholic Tommy Moolick. Pointedly though, Offaly failed to score for the rest of the half as the visitors took a vice-like grip. 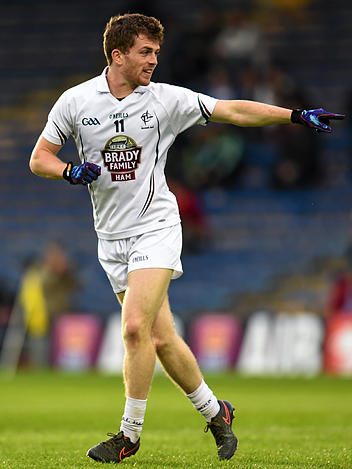 Even before Dunne’s rush of blood, Neil Flynn had leveled matters with a free and within a minute of the dismissal, Conor Hartley and Flynn again put Kildare two in front. The Whites were starting to motor, finding lots of gaps in the Offaly rearguard and picking out a dangerous full forward line with good diagonal passing. Niall Kelly (pictured) was head and shoulders above every player on the field all day and the Athy man turned the screw with a sublime finish to the net on 14 minutes. He seems to like the bottom left hand corner as he replicated his goal last week against Longford, but from further out. Try as they might, Offaly were ragged now, sleep-walking into tackles, hitting wayward passes and even at times solo-ing the ball into the arms of an opponent. Confidence drained. Small crowd silenced. Points from Kelly and McNally stretched the lead further before a sweeping move ended with a queue of Kildare players lining up to find the net. In the end Flynn unselfishly fed Eoin Doyle and the skipper rammed home the Lilies’ advantage. The excellent Fergal Conway and that man Kelly found the range again before half time and Kildare went in 12 points ahead. Game over. Half time score 2-8 to 0-2. Kildare will be most disappointed with the second half. Whatever was said at half-time, it certainly didn’t have the desired effect. Energy levels declined noticeably and Kildare began to run into blind alleys whenever they crossed the half-way line. Perhaps too keen to replicate that fine second goal. Poor Cian O’Donoghue could relate to Paul Pogba’s travails in the Manchester United/Liverpool game later in the day. The Clane man gave away two easy frees to help Willie Mulhall stop the rot for Offaly and O’Donoghue seemed to run into trouble whenever he sallied forward from wing back. He’s had better days and will have them again. No doubt he’s put plans for a social media emoji on the back-burner for now. Offaly brought the deficit down to 9 points by the 40th minute and with Shea Ryan receiving a straight red for a perceived foot into the back of Michael Brazil, a goal at that stage could have revitalised the game. As it was though, Kildare found the net for a third time to put the issue to bed. With Moolick receiving attention in front of the posts for a head injury, Offaly keeper Alan Mulhall fluffed a kick out, sending it straight to Flynn. Moolick resurrected himself miraculously and the unmarked Leixlip man was on hand to bat the resultant pass to the net. Referee consulted umpires but try as they might they couldn’t think of any reason to disallow the goal. From there on it petered out somewhat, the ridiculous number of substitutions not helping matters. Kildare used 9 subs, although two of them looked quite familiar. Such is the small squad Cian O’Neill is working with, he re-introduced Conway and Hartley for the final 10 minutes having replaced them earlier. The Kildare boss will hope for a sterner test against Dublin in the semi final on Sunday. Kelly was the standout performer with 1-4 from play. He seems to be enjoying a roving full forward role. Beside him Flynn was a bundle of energy as was young Ben McCormack, although the Sarsfields man had one of those days where the posts seemed to gradually get narrower as the afternoon wore on. He drew a blank on the scoreboard despite plenty of opportunity. Hartley was also relatively quiet this time and Ryan may have learned a harsh lesson or two from his day. He had already been booked for a high block to the face before his red card infringement. Doyle was again superb at the back, quite apart from his goal. It’s a brave man that tells Moolick he’s standing still and to “get a f***ing hand in” on the cusp of half-time with the game effectively won. Beside Moolick, Dowling was under-stated but effective. He came into his own particularly when his partner departed, fielding and distributing well. Conway continued his excellent form of the last 12 months. We’ll forgive the couple of over-exuberant wides though on that front O’Neill will have been less than impressed with the 8 wides shot during that first half dominance. That the number halved in the second period was as much a reflection of the evening out of the game as anything.